Sensorband was a trio of musicians using interactive technology. Gestural interfaces - ultrasound, infrared, and bioelectric sensors - become musical instruments. 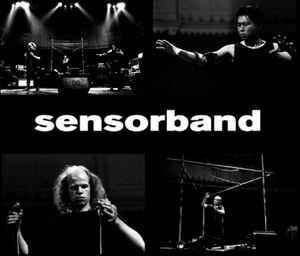 The group, Edwin Van Der Heide, Zbigniew Karkowski, Atau Tanaka, each soloists on their instruments for over six years, formed Sensorband to create a performance ensemble. Edwin plays the MIDIconductor, machines worn on his hands that send and receive ultrasound signals, measuring the hands' rotational positions of and relative distance. Zbigniew activates his instrument by the movement of his arms in the space around him. This cuts through invisible infrared beams mounted on a scaffolding structure. Atau plays the BioMuse, a system that tracks neural signals (EMG), translating electrical signals from the body into digital data. Together, Sensorband creates a live group dynamic, bringing a visceral physical element to interactive technologies. Sensorband's projects center around the theme of physicality and human control/discontrol in relation with technology.